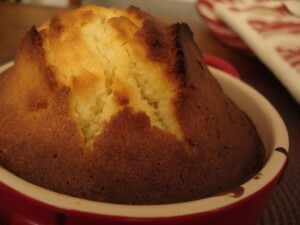 A quatre-quart is a simple cake traditionally made with four different ingredients (eggs, sugar, flour and butter) in equal parts. Thus the name, “four-quarters”. One thing I’ve learned about French cooking is that you have to have a scale. Unlike American recipes, European ones give ingredients in weight (i.e. grams for butter or kilos for potatoes). It certainly took me some getting used to, but now that I actually own a digital scale (and am no longer translating grams to ounces to tablespoons and then scooping butter out of the mold with a metal spoon), I’m enjoying how easy it is. Thanks to weight, I recently made my first quatre-quarts, on a very small scale (no pun intended). The story goes, I was really in the mood for something yummy – and the idea of trying my hand at a quatre-quarts had been swirling in my head for a while. Problem: I looked in the fridge and only found one egg. What better challenge! If you really put in egg, sugar, flour and butter in equal amounts to make a quatre-quarts, why shouldn’t it work? It’d just have to be a small one. 1. Weigh the egg(s) (no shell of course). 2. Weight the other main ingredients (sugar, flour, butter) to the same mass (except the sugar which can be a little less). 3. Begin melting the butter. 4. Mix the egg and sugar. 6. Add the flour and baking powder (see above). 7. Add the the lemon juice and vanilla. 8. Bake in a prepared dish (bottom lined with wax paper and edges smeared with butter) at 190 degrees C for about 30 minutes. For a normal-sized cake, use 3-4 eggs. This entry was posted in Recipes (All) and tagged dessert. Bookmark the permalink.